A catamaran designed for disabled sailors has been built in the South West. The boat, named the Impossible Dream, will go on display for the first time at the Southampton Boat Show later this week after undergoing final sea trials. The boat was the vision of Mike Browne, a sportsman who was paralysed after crashing over a precipice in a skiing accident five years ago. "It's hard to explain to someone who isn't confined to a wheelchair just what it means to be independent and have the freedom to go wherever you want," he said. "But that is what it is all about." The boat is fitted with all the latest super-yacht technology squeezed into its 60-foot length. It has a "racetrack" running around the perimeter of the boat to accommodate a wheelchair. There are also lifts to move between decks, while the controls for sails and winches are indoors, as is a main control panel for navigation and communications. 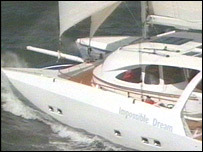 The project to build the yacht began in 2001, with the work being carried out at Multimarine in Cornwall. Designer Nic Bailey, from Dartmouth in Devon, said: "We had to throw away all the assumptions for designing a boat for an able-bodied person and start again with a clean sheet of paper. "We had to work out how a person in a wheelchair could get from the dock onto the boat, and then move around the boat itself." 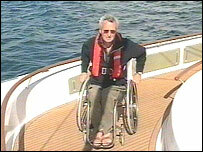 The Sporting Activities for the Disabled charity, which Mr Browne set up, has paid more than £1m to buy the boat. "The dream is now a reality"